Public views of the federal government in Washington have fallen to another new low, according to a Pew Research Center survey conducted in March. 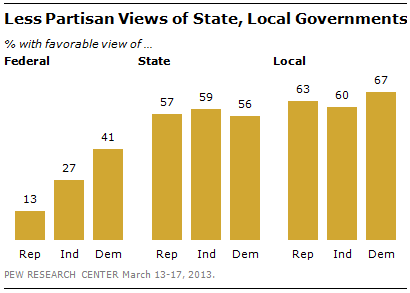 While majorities of Americans see their state and local governments favorably, just 28% rate the federal government in Washington favorably. That is down five points from a year ago. The percentage of Democrats expressing a favorable opinion of the federal government has declined 10 points in the past year, from 51% to 41%. For the first time since Barack Obama became president, more Democrats say they have an unfavorable view of the federal government in Washington than a favorable view (51% unfavorable vs. 41% favorable). In July 2009, when Obama took office, 61% of Democrats expressed a favorable view of Washington. Favorable opinions of the federal government in the March survey among Republicans, already quite low in 2012 (20% favorable), have fallen even further, to 13% currently.